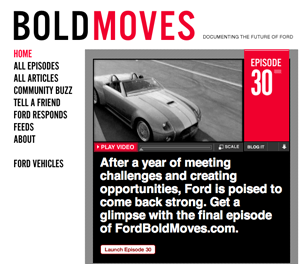 Episode 30 of Ford’s Bold Moves advertorial campaign airs today, and it proves definitively that Ford deserves its fate. There is not one word – not even one single freaking word – in the wrap-up video about fuel efficiency. Or the environment. What planet are these people living on? In my book, that negates any good the campaign may have done. I pity Ford’s stockholders if focusing on what the cars look like is the way Ford sees the future. so let me guess, they will (prediction coming) HAVE to Fix Or Repair Daily their ongoping campaign??? Next thing you know, will Edsel “Peugeot” Ford XIV take over the reigns of Henry’s skeleton of a company?